Looking for a new smartphone from T-Mobile? The 4G Super Sale that the carrier will run over the weekend might be a great opportunity to grab one. On December 17 and 18, all T-Mobile phones will be priced at zero after rebate, including its top-shelf handsets like the Samsung Galaxy S II and the HTC Amaze 4G. Of course, there is a catch. Your signature under a qualifying 2-year Value Plan is required, and the remainder of the device's cost must be paid in 20 monthly installments. Besides, the deal is available only to new customers and to subscribers that have been with the carrier for over 18 months. Still, if none of that bothers you, feel free to visit a participating T-Mobile retail store and grab a new, shiny smartphone. Keep in mind, however, that the deal is not available online, so you need to do it the old-fashioned way – drive downtown and pick it up yourself. Check out the press release below for all the details. Bellevue, Wash. — Dec. 13, 2011 On Saturday, Dec. 17, and Sunday, Dec.18, T-Mobile USA, Inc. will continue to celebrate the spirit of the holiday season with the “4G Super Sale.” For two days only, consumers will have the opportunity to select any phone or specified mobile broadband device — including the new T-Mobile® SonicTM 4G Mobile Hotspot and G-Slate® — for $0 net down payment, after a mail-in rebate card, when they sign up for a new two-year agreement on a qualifying T-Mobile Unlimited Value™ plan1, all running on America’s Largest 4G Network®. “T-Mobile wants to give last-minute shoppers one more chance to get a great deal for their holiday shopping,” said John Clelland, senior vice president of marketing, T-Mobile USA. “We want to make the best data devices accessible to all, and what could be better than being able to find the right device to give a loved one at a great price?” New customers will be eligible for this deal when they sign up for a two-year agreement on a qualifying Unlimited Value™ plan2. Existing customers also can take advantage of this great offer if they are eligible for an upgrade, meaning 18 months or greater tenure. Following this year’s successful holiday promotions on “Magenta Saturday” and Black Friday, which saw double the sales expected, customers have the opportunity to get T-Mobile’s latest hot devices for a great deal — in this case, $0 net down. 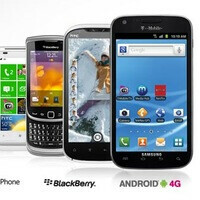 T-Mobile’s “4G Super Sale” includes, among other devices, the HTC Radar™ 4G, Samsung Galaxy S™ II, HTC Amaze™ 4G, T-Mobile myTouch® Q, BlackBerry® Torch™ 9810 and the new T-Mobile® SonicTM 4G Mobile Hotspot. http://deals.t-mobile.com/zero-down?cm_mmc_o=lBgbzkFwpbzCjCzczywEwllCjC5ywllywkwzlwCjCkzlfgtzEgwwMwEfnivv. T-Mobile’s HSPA+ 4G network not available everywhere. See coverage details at T-Mobile.com. 1 Equipment installment plans: On approved credit and 0 percent APR. Down payment and unfinanced portion required at purchase. Remaining balance paid in 20 monthly installments. Total post-rebate price of each device equals down payment amount plus monthly payment amount times 20. 2 Devices must be supported with the following data requirements: voice phones: 200 MB data; most smartphones: 2 GB data; 42 Mbps devices (Amaze and GalaxyS II): 5 GB data. you obviously misunderstand the point. the value plan is a severely discounted plan. unlimited everything is only $60 bux. The trade off for that is you are paying full retail for the phones over time. It however saves you $500 over the regular contract plans PER LINE, so its worth every penny. Basically, what this is doing is taking another $200 off of the total cost of the contract by reducing the price of the phone. Its a great deal. I agree, it's a bad marketing promo and a bad deal. It's not free if you have to make monthly payments. Also, I hate rebate cards -- it's slow, or it gets lost, too much hassle. It says put a smartphone in your hands for free. To you and I that means read that small print and see what it requires, to a basic consumer not in our industry it means "free phone". Remixfa is right on it. Tmobile is giving you $200 of retail price of the phone, and not making you pay a sub free. Every other carrier is going to make you pay a sub free reguardless if you use your own phone are not. People are just mad because the phone isnt free. What would you rather? Save $200 up front or save $500 over the life of the whole plan? People are too focused on FREE FREE FREE, when its really not FREE. You pay for the phone in the price of the plan. Just do the math.